Along came the reverse-trike, sometimes referred to as a tadpole configuration which also appeared quite early in the development of motorcycles. In 1909, Henry Frederick Stanley Morgan built his single-seater, rear-wheel drive, runabout.The stability problem was somewhat mitigated, cornering became smoother and handling improved dramatically over the traditional layout. This isn’t to say that Morgan had eliminated all of the idiosyncrasies that are common to three-wheelers. As with all great inventors, research and development continued through multiple models and of course, many other enterprises developed their own vehicles as well. Enter Steve Hall. From his earliest days his mother says she remembers a distinct and abiding zest for all things motorized.Hall had a deep passion for all things motorsports and owned a very successful exotic and luxury vehicle dealership, however,something was missing. He felt that the day of the driver being one with the machine, the open cockpit and feel of the road may have been lost somewhere along the way. There are of course many convertibles, ground hugging cars and a few reverse trikes(Polaris Slingshot, Morgan Three-Wheeler and Can Am Spyder come to mind) that evoke a similar feeling but it was not quite there. That undefinable factor was eluding him. How do you take the style of the open-wheeled, roll-bar hooped race cars of the past and update them with modern drivetrain, suspension, electrical components and safety features?In other words, build a vehicle that nods to the past while advancing into the future at the same time. Hall embarked on a journey that would create something uniquely his and that in the true sense of the word would be timeless. This initial foray was solely personal. As he stands at an imposing 6’6”, there are not many exotic vehicles that will accommodate his frame comfortably. But as time passed and the research and development progressed through a number of iterations, the passion of creation lead Hall to focus not just on himself, but creating a vehicle for resell. This is that journey. Vanderhall Motor Works was founded in 2010 and Hall jumped in with both feet. To provide the level of exhilaration that Hall wanted to deliver, certain engineering feats had to be overcome. A dream fully realized must exist in the real world. Historically, three-wheel motorcycles have had numerous stability, reliability and performance issues. Some companies producing a three-wheel motorcycle in the reverse trike configuration utilize the design of a front mounted engine, with a driven rear wheel. The Polaris Slingshot and Morgan three-wheeler mentioned earlier rely on this combination. Other companies in this arena are utilizing a rear/mid – mounted engine and rear-wheel drive. The Campagna T-Rex, Tanom Invader and Can-Am Spyder all have successfully used this particular layout. While there are advantages to both configurations, there can also be instability issues created under certain conditions when regarding weight transfer from front to rear and tendencies to oversteer. Hall spent several years experimenting with multiple layouts to determine which would work best, and therefore, provide the greatest driving experience for the consumer. Everything from frame geometry to power plants to suspension were looked at and if something looked viable, it was tried out. It was this dedication to experimentation that ensured that the final production vehicle would not only be received by the public, but embraced. The first three prototypes from 2010 to late 2011 focused on a rear-wheel drive system and a single seat design. Multiple engine types were tried but the right combination of power and torque wasn’t quite right. The first real fundamental change came in 2012, when prototype number four was switched to front-wheel drive and things changed dramatically from there. 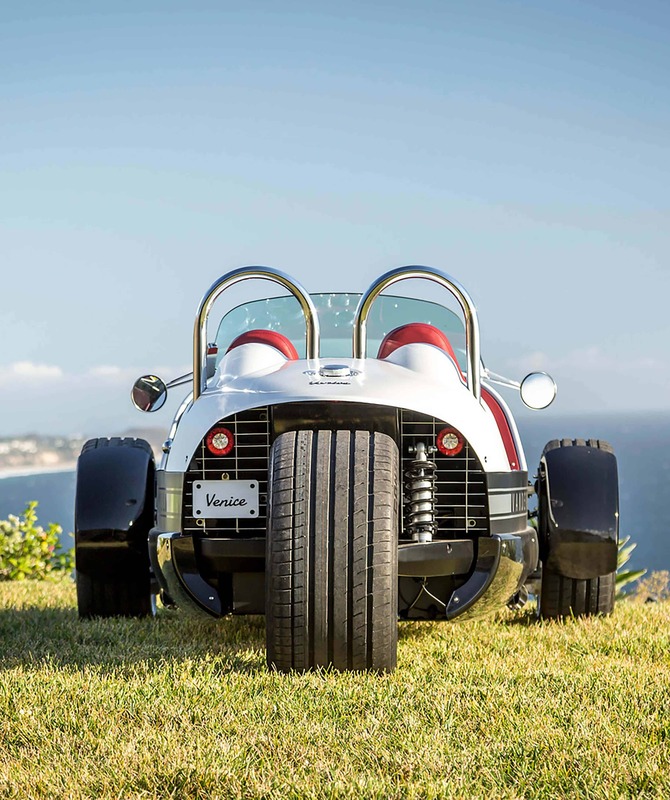 Handling and stability increased substantially and gave a dramatically different feel to the Vanderhall roadster. Although some purists and diehard gear heads may say that nothing that is front-wheel drive can be fun and exhilarating, we beg to differ. With the increased traction and the 70/30 weight distribution, stability and handling now approached that of most sports cars: little understeer and an almost neutral handling. Further into 2012, prototype number five was also the transition to a two-seater, providing the opportunity to bring along an eager passenger. By 2014 the prototyping was in full swing and iteration number seven was the first example that started to give the vehicle the look it has today. Having decided that fully surrounded front wheels like that of a car did not engender a timeless feel, the body panels were paired down and the open-wheel configuration came into view. Now Hall was very close to the elegant cars of yesteryear while providing modern thrills to a new generation. By 2014-2015, prototype number eight was tweaked and finessed until the vehicle that is now the Laguna was born. Traditional motorcycle engines had been tried and eventually replaced with the 1.4L Turbo engine that is in use today. This small but mighty power plant has the power and torque to launch off the line quickly and keep you motoring efficiently to your hearts’ content. The power to weight ratio is about as good as it gets with just the right amount of horsepower to frighten. Some have asked why we made it an automatic. Why isn’t this vehicle equipped with a manual transmission? The answer is actually a simple one. Our customers, those that buy our machines and therefore enable us to do what we do, have demonstrated a propensity towards automatic, although we have incorporated paddle shifting for the Laguna and bump-shift for the Venice. Down the road, we hope to release a manual but at less than 10% of total sales, it is difficult to justify as a boutique manufacturer. The other vital component, and one crucial to our superb handling, is the pushrod suspension. Inspired by the race track, it is completely unique to this type of vehicle. Its function allows the driver to “feel” the road and move with the curves while maintaining a precision unequalled in handling, cornering and braking. Five years of dedication and untold hours of testing ensured that Hall had the vehicle that not only he wanted, but that the savvy consumer would want as well. Each Laguna is painstakingly hand-built to exacting specifications. The Laguna chassis is a patented, hand welded, mono-aluminum structure that is light (a mere 200lbs when stripped), yet strong. Into that is fitted an artistically crafted interior and that in turn is surrounded by a hand-laid carbon fiber body. Finish it off with a beautiful paint job (by hand), and you are presented with a rolling work of art. The hands of these craftsmen have come together with one purpose: create a truly unique and gratifying motoring experience. The Journey that has allowed Hall to bring the Laguna to market, has also enabled continued progress and some would say, a truer retro-modern model in our most recent release: the Venice. Now the decision-making process begins with a choice between Laguna or Venice. 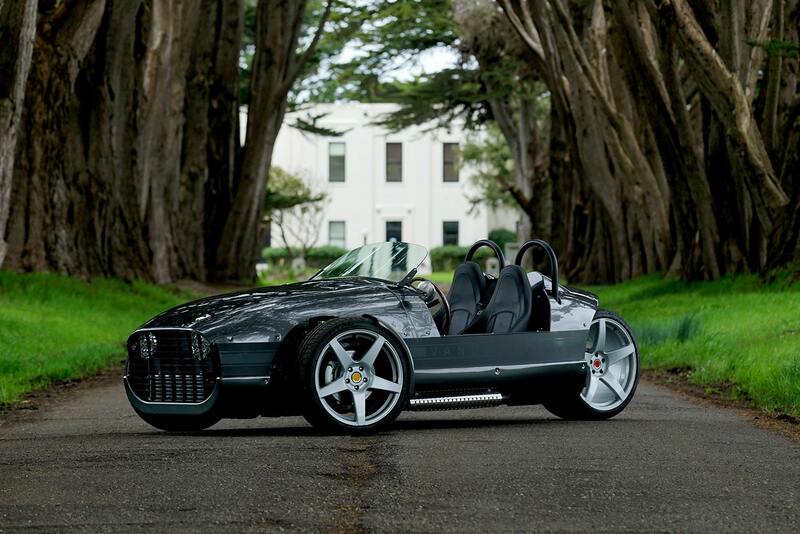 While it is true that the Laguna, with its carbon fiber shell, wool carpeting and bespoke build options lends itself to a more exclusive three-wheeled crowd, the Venice at only $29,950, opens the door to every enthusiast of unique automobiles and motorcycles. Either choice will excite passion and smiles from friends and strangers alike. That brings us to a bit of an identity crisis. 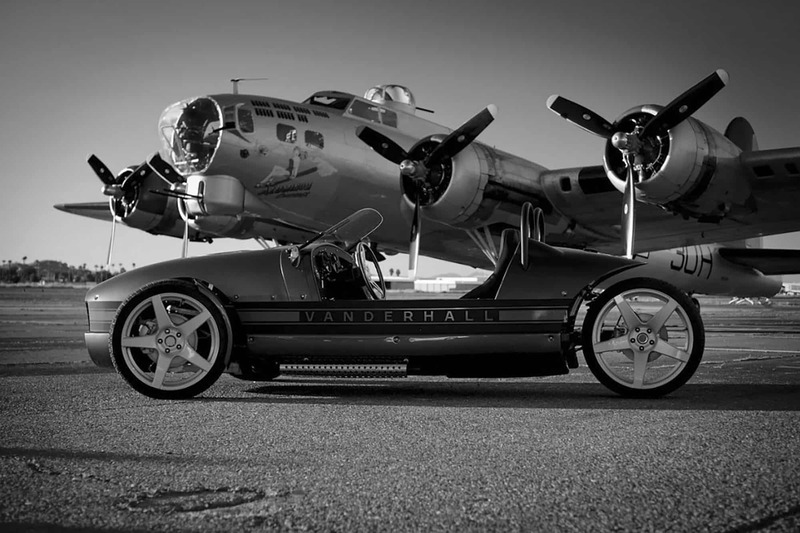 Vanderhall straddles the world between automobile and motorcycle. Vanderhall often uses “roadster” to describe its vehicles, extending the early nineteenth century definition of the word which denotes “a horse worthy of traveling”. But what is this creation? Is it still a three-wheeled motorcycle? Is it a three-wheeled car? Are “reverse trike” or “autocycle” more correct terms? To further confuse things, states define this platform differently. Some have created autocycle designations—often eliminating the need to have a motorcycle endorsement for licensing. It boils down to one thing: the three-wheeled vehicle has made many advancements over the decades and is delivering the thrills and excitement those first automotive pioneers felt as they took their creations on the open roads for the first time. The National Highway Traffic Safety Administration (NHTSA), defines the Venice and Laguna as three-wheel motorcycles. They do not undergo the same crash testing as a traditional automobile nor do they have airbags or other automobile specific safety features so to call it a three-wheel car is not accurate. As mentioned, several states have created the designation of “autocycle” which denotes a three-wheel motorcycle that has side-by-side seating. Currently around 28 states offer an autocycle provision. This number is assumed to continue to grow with the increased popularity of the platform. Whether its a three-wheel motorcycle, reverse trike or autocycle, certain factors remain constant. They are required to stay under a maximum weight limit, have specific reflectors for visibility, and in our opinion, illicit sheer joy and excitement from those that drive them. A final note on the Vanderhall and its classification with the NHTSA. Since we are considered a three-wheel motorcycle, helmet laws do pertain so be sure to check the requirements in your particular state. As so many of our customers are already motorcycle enthusiasts, we are sure that you are way ahead of us. 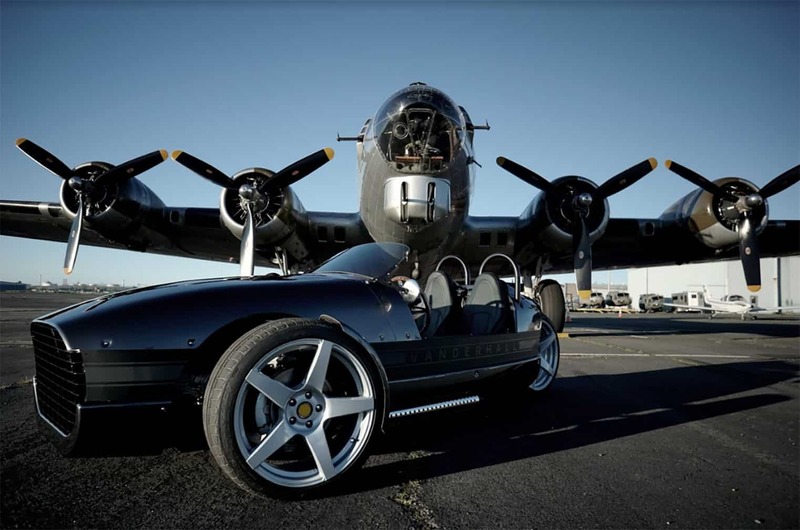 Vanderhall Motor Works are located in Provo, Utah and we will soon offer tours of our facility. In the interim, inquiries are directed to our dealers or you can reach out to us directly as we are happy to speak to any current or prospective customers. Vehicles, with the exception of a select few, have become utilitarian and simply a tool, a beast of burden to go to work, go to the gym, pick up groceries. The “horse worthy of traveling” is nearly extinct. Vehicles with their mundane functionality and disconnection to that road will transport you to your destination but at the cost of your driving soul. That does not need to be the case. Bring back the love affair with driving and add your name to the list of those that looked back, to look forward. Drive passionately. 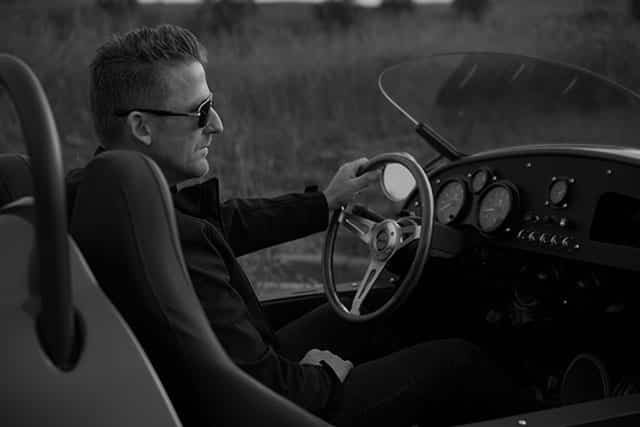 At Vanderhall, we believe we have created, revitalised, a driving experience that returns the motorist to the golden age of motoring – driving for the sake of driving. In the early days of the automobile and the motorcycle, the thrill was in the feel of the road in a vehicle that made you want to be a part of it. If we could place one of our vehicles back in time, to early days of motoring, the men and women then would marvel but feel it belongs. We feel its timeless body lines and elegant grace are also perfectly suited to be on the road today. 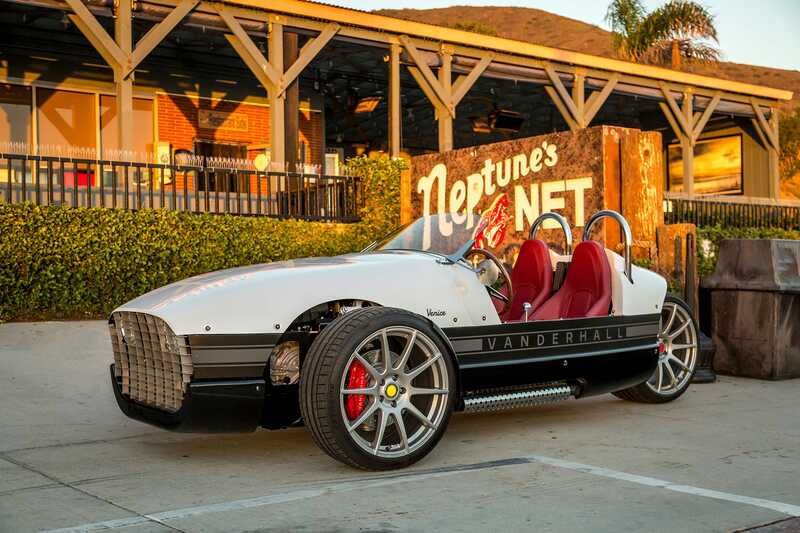 The road is calling again, and a Vanderhall roadster is your means to answer that call. Take a step into the world of Vanderhall today with performance, class and style. We are proud to carry on the tradition of producing fine, hand-built vehicles that started well over a century ago. As you join us on the road, it important to be mindful of one thing. We hope you like attention, because wherever you go, and especially whenever you stop, you’re going to make a lot of new friends.